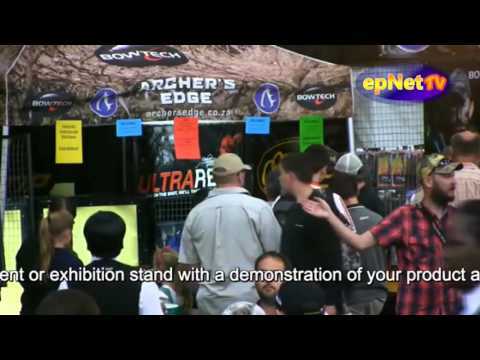 Webcasting Epnet » Top 10 Exhibitions Companies South Africa Live Streaming. An exhibition is possibly a one off event or at most an annual event. What do you do for the rest of the year? If you film your event or exhibition stand with a demonstration of your products and services you benefit all year round. Not only that but it can be live streamed while the exhibition takes place you can attract more people to attend. Exhibiting is the most cost effective way to reach the greatest number of decision makers in your specific target market in the shortest space of time and 48% of exhibition leads do not require a sales call to close the deal. An exhibition has a very special atmosphere that assumes excitement with the sounds of people milling around, announcements being made over the intercom etc. This also adds to your sales messages as it gives some excitement to your delivery on video which helps to give a real sense of popularity, awareness and some urgency all on its own, something you can not re-create in a studio. Have a listen to what we mean by watching a minute or two of our video on this page. You must have an invitation list like members of your newsletter, a customer list or Facebook and Twitter fans. You can announce the up and coming event some time before it actually takes place. Build-up excitement before the event goes live prior to the day. A live stream or web video can work for you all year round so you get a much bigger audience. Remember if you are going to invest in an event why not invest in your company with a year round value and return on your investment in 2016, contact us today. Contact me Gordon Barker on 011 807 403 for a consultation. Don’t be content with what you have done before imagine what could be! Trade shows present a range of valuable opportunities for companies that participate, including meeting potential customers, finding new and better ways of doing business and building a more impressive reputation within an industry. The top reason exhibitors exhibit at trade shows is to raise the awareness of their company and brand. Nearly 9 out of 10 exhibitors agreed this is a reason for their participation at events. They build their brand, the awareness of their products, and improve the name recognition of their company. Raising awareness is even more important for new companies, new exhibitors, or companies entering new geographical or vertical markets. But they lack continuity and are over in a day or two. A live video stream service like Epnet are able to provide long lasting continuity of your exhibition efforts and investment. A live stream or web video can work for you all year round so you get a much bigger audience and return on your investment. Remember if you are going to invest in an event why not invest in your company with a year round value and return on your investment, contact us today. If you are involved with this market and are exhibition organisers we can partner with you to provide an extra service to your exhibitors. Promising them a live stream can also boost your service offerings and returns.